Andrew Murray is a composer, arranger, trombonist, pianist and musical director. Andrew’s compositions have been awarded first place at the National Big Band Composing Competition (Wangaratta Jazz Festival, 2009) hosted by APRA and The Jazzgroove Mothership Orchestra. That same year Andrew also won Sweden’s premier International Big Band Composing Competition. 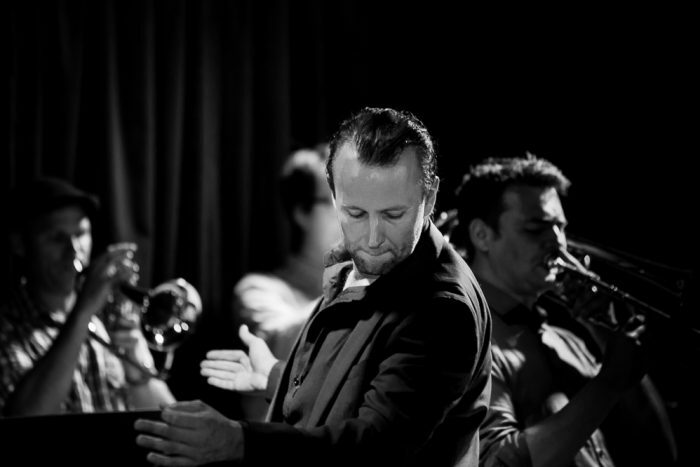 Andrew has served as Musical Director for ATM15 Big Band, The Randy Anderson, Bird’s Basement Big Band, Melbourne Youth Music Big Band, and the Victoria Police Bands. Andrew’s compositions and arrangements have been recorded by ensembles ATM15 (including a 2016 nomination for Best Jazz Album in the Age Music Victoria Awards), The Randy Anderson, and Josh Kyle’s Trombone Song Cycle. Performances have include The Wangaratta Jazz Festival, Chapel Off Chapel, Stonnington Jazz Festival, Bennetts Lane Jazz Club, Paris Cat Jazz Cub, The Malvern Town Hall, the Jazzlab, Hawthorn Arts Centre, Melbourne Recital Centre, The Gasometer and Palms at Crown. Andrew has been commissioned to compose music for Fred Wesley, the opening of the 2018 Commonwealth Games, Kate Ceberano, Bobby Fox, the WA Youth Jazz Orchestra, Wesley College, and Eltham High. As an educator Andrew has taught at the James Morrison Academy, Monash University, The Australian Institute of Music, and numerous high schools and primary schools. As a composition student Andrew has studied at The University of Music and Dramatic Arts in Graz Austria, at the Western Australian Academy of Performing Arts, and the Gordon Institute of TAFE. Teachers have included Bob Brookmeyer, Ed Partyka, Darcy James Argue, and Graham Lyall. My goal as a teacher is to tailor my lessons to your interests and your skill level, while sharing and encouraging a love of music. I aim to equip you with the tools you will need to understand the building blocks of music and then encourage you to use them to explore your own creativity. I enjoy teaching anyone from kids to professionals who are keen to learn. I have taught composition, arranging, theory, harmony, trombone, piano, and trumpet, at primary schools, high schools, universities, choirs, big bands, concert bands, and rock and pop ensembles. Please feel free to get in touch with any further questions or to book in a lesson. I teach from my home space in Fish Creek, but travelling to you is also a possibility. I hold a current Working With Children check.